Leaders of Germany’s Social Democratic Party say they plan to go into the opposition after their disappointing second-place finish in Germany’s election. The Social Democrats have been Chancellor Angela Merkel’s junior coalition partner for the last four years but finished with only about 21 percent of the vote Sunday, according to early exit polls. Their decision complicates things for Merkel, who will have to look to other parties to form a new government coalition. The head of the Social Democrat’s parliamentary caucus, Thomas Oppermann, and party deputy leader Manuela Schwesig both said immediately after the results the party would go into opposition. Exit polls suggest Chancellor Angela Merkel’s conservative bloc has finished first in Germany’s election, putting her in a position to lead the country for a fourth term. Exit polls conducted for public television channels ARD and ZDF suggested support for Merkel’s conservatives was between 32.5 and 33.5 percent in Sunday’s vote. They indicate challenger Martin Schulz’s Social Democrats trailed in second place with between 20 and 21 percent support. The polls also suggested that the anti-migrant, nationalist Alternative for Germany party will enter the national parliament for the first time with 13 to 13.5 percent support. Mainstream German political parties are urging voters via Twitter to cast their ballots against the nationalist anti-migrant Alternative for Germany party. To that Petry answered: “The bill for your hate tirade will be punctually at 1800” — or 6 p.m., when the polls close in Germany. The AfD is expected to enter the German parliament for the first time after Sunday’s vote. Germany’s federal election authority says national voter turnout is slightly down so far compared to the last election in 2013. Polls have been open since 8 a.m. and the Federal Returning Officer said that as of 2 p.m. Sunday 41.1 percent of eligible voters had cast their ballots. That was down slightly from 2013, where 41.4 percent of eligible voters had cast their ballots by 2 p.m. That election ended up with 71.5 percent overall participation. The office urged Germans to get out and cast their ballots, noting that polls were open until 6 p.m. Absentee ballots aren’t considered as part of the turnout and there are expected to be a record number this year. Angela Merkel, who is seeking a fourth term as chancellor in Germany, has voted at a polling station near her home in Berlin’s Mitte neighborhood. Merkel and her husband Joachim Sauer, who shielded both of them with an umbrella against the cold drizzle, were surrounded by dozens of reporters as they cast their vote Sunday. The couple smiled and nodded at bystanders. The chancellor’s conservative bloc has a healthy lead in the polls. Surveys in the last week show Merkel’s bloc leading with between 34 to 37 percent support, followed by the Social Democrats with 21 to 22 percent. First exit polls are expected after German’s polling stations close at 6 p.m. (1600GMT). Chancellor Angela Merkel is widely expected to win a fourth term in office as Germans go to the polls in an election that is also likely to see the farthest right-wing party in 60 years, the anti-migrant Alternative for Germany, win seats in parliament. Merkel has campaigned on her record as chancellor for 12 years, emphasizing the country’s record-low unemployment, strong economic growth, balanced budget and growing international importance. That’s helped keep her conservative bloc well atop the polls ahead of Sunday’s election over the center-left Social Democrats of challenger Martin Schulz. Merkel’s conservative Christian Democratic Party and its sister party, the Bavaria-only Christian Social Union, have governed Germany for the last four years with the Social Democrats in a “grand coalition.” Most forecasts suggest that coalition will win another majority in Sunday’s election outcome, but several different coalition government combinations could be possible. The latest polls had Merkel’s conservative bloc at 34 to 37 percent support, the center-left Social Democrats with 21 to 22 percent and the anti-migrant Alternative for Germany, or AfD, with 10 to 13 percent support. Pollsters say many of the 61.5 million Germans who were eligible to vote had remained undecided until the very last moment. Countries across Europe have seen a rise of anti-migrant and populist parties in recent elections and several German pollsters have forecast that the anti-migrant, anti-Europe Alternative for Germany may come in as Germany’s third-strongest party. The AfD appears assured of gaining seats in the national parliament for the first time. 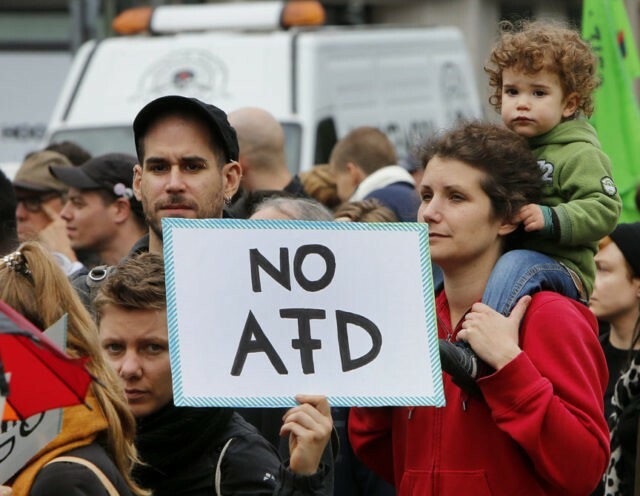 The AfD has led an aggressive campaign that was dominated by hostile slogans against the more than 1 million mostly Muslim migrants who arrived in Germany in the last two years. They’re aiming to grab votes from conservatives who in the past have voted for Chancellor Angela Merkel’s party, but are unhappy with her welcoming stance toward refugees. In addition to the Social Democrats and the AfD, the Greens, the Free Democratic Party and the Left Party were all poised to enter parliament with poll numbers between 8 and 11 percent. David Rising and Kerstin Sopke contributed reporting from Berlin.